Casa Granada beachfront – 6 bedrooms for 12-13 guests. Las Terrenas – Playa Coson – Sunset Villas. 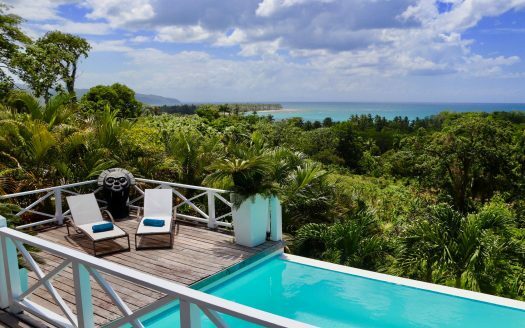 Casa Granada is located in on a prime beachfront lot at famous Playa Coson in Las Terrenas. Inside a quality residential complex comprising 4 fabulous Balinese style villas. Playa Coson is recently ranked as the 4th most beautiful beach in the world. So here at Sunset Villas are 4 the same villas for rent: same size, same bedrooms and interiors and same prices: Casa Pina, Casa Limoncilla, Casa Granada and Casa Ciruella. Only differences are the color and smaller details. 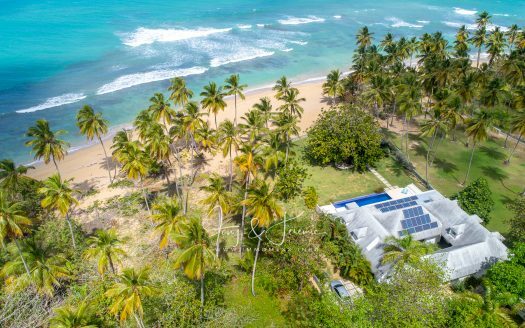 This private complex at the beach boasts a privileged, private location while only 5 minutes from the town center of Las Terrenas and all its amenities. Each beach villa offers a range of services designed to make your holiday pleasant and comfortable. It is an ideal place for a family holiday and/or with friends but also ideal for special events such as honeymoons or company incentive trips. A private pool with swim-up bar for entertainment and fully furnished terraces with deck chairs and garden furniture. The villa has round-the-clock surveillance guaranteeing safety and privacy. These villas have a very low noise level. The kitchen is fitted with state of the art equipment where the Chef (optional) can prepare a vast range of local and international specialties just for you! Help in the breakfast is included but you can also order your meals a la carte or simply enjoy preparing them yourself. Villa description: private parking with normal entrance gate and electric car gate. Intercom system, large double garage and backyard. In house living maid and gardner. They are living in the backyard, separated from the villa. All laundry facilities are available.Extra small quarter with bed and bathroom for an external nanny if you like or if you want to bring on of your own employees or chauffeur. Electricity generator if there is electricity black out. Special water system. 5 from 6 bedrooms have each there own safe locker. All bedrooms have private bathrooms with shower and toilets. Large dressings and king size beds in the bedrooms. – 6 spacious air conditioned bedrooms are at your disposal, each with king size bed, en suite bathrooms and dressing rooms, two of which have a private terrace with a breathtaking view of the ocean. All bedrooms have airco and 5 of 6 bedrooms have a safe box. On the first level are 3 bedrooms and the tv-room. 1 bedroom is facing the pool and has a terrace. 1 bedroom is facing the backyard and has private terrace. In the middle is another bedroom with extra bed for a child. This bedroom has an extra door towards the pool. Large tv-room with airco and private bathroom and terrace. Doors can be closed. 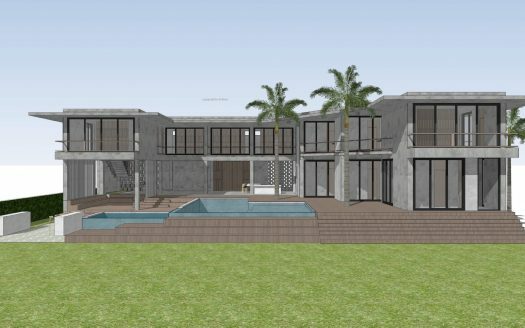 On the second level 2 different lounges and 3 bedrooms: the large master with private terrace facing the ocean, other bedroom and bedroom next to the master bedroom. Easter, Christmas, New Year / Week 15.000 US$. Full week rental. 2,200 usd per day extra. -above max. de 12 persons 75 usd per person/kid younger then 6 years and 150 usd per night per person older then 6. The Owner will confirm a Reservation once the application has been approved and initial or full payment has been processed. An initial rental deposit payment of 50% of the rental fee will be due at the time of booking. In the event of a reservation not being accepted by The Owner, all fees paid will be refunded immediately. Any booking made within 21 days of the start of the rental period must be paid in full by bank wire transfer at the time of booking. No reservation may commence without full payment being cleared. Once a reservation is received and accepted by The Owner, The Renter is liable for payment of the balance of the rental fee 21 days before occupation of the property. Non-payment by the due date will be treated as a cancellation and the deposit will be forfeited. In addition to the rental fee, a security damage deposit must be paid by bank wire transfer with the balance of the rental fee or in cash at the moment of arrival at the property. The Renter will not be permitted access without the payment of the damage deposit. The Owner will return the damage deposit no later than 7 days after the date of departure of The Renter, unless The Owner has a valid claim to make upon it, such as but not limited to unreasonable damages caused to appliances, furniture, and recreational facilities not imputable to normal wear. The Renter will be responsible for any damage caused in excess of the damage deposit. – If cancellation or modifications occur up to 21 days before the date of arrival, no fee will be charged. – If a reservation is canceled or modified later, 50% of the total price of the reservation will be charged. – In case of no-show, the Renter will forfeit all moneys paid for that period.